Join Kathrin Godthardt and her webinar on an GMP-compliant workflow for MSC isolation, expansion, and cultivation. MSCs have been investigated in a variety of clinical trials for the treatment of graft-versus-host disease and tissue regeneration. The antigen CD271 is expressed on MSCs and can be used for the magnetic enrichment of these cells. 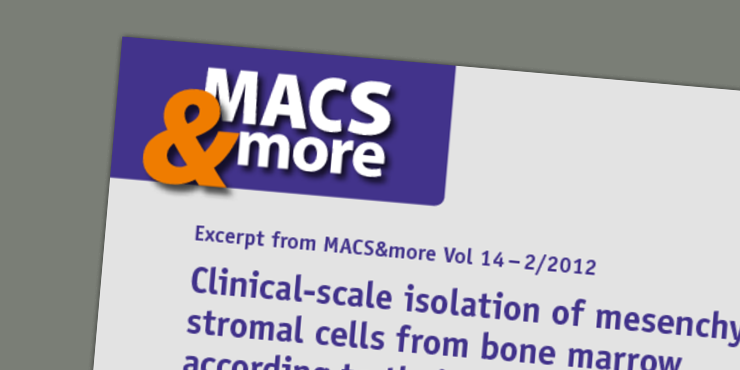 The characterization of CD271+ cells revealed that the colony-forming-unit fibroblast (CFU-F) potential is highly and exclusively enriched in the CD271+ cell fraction after enrichment using the CliniMACS® System. Following this strategy a well-defined cell population can be used either directly or expanded in culture for pre-clinical and clinical investigations. In addition, the cross-reactivity of the antibody shown in large animals may one day allow for an easy translation of pre-clinical investigations into the clinical area. MSC-Brew GMP Medium is an optimized and standardized medium for the generation and expansion of MSCs from human bone marrow or other tissue sources. The formulation of MSC-Brew GMP Medium is designed to efficiently support the expansion of MSCs in vitro, while maintaining their differentiation potential. The medium is xeno- and serum-free and is manufactured under strictly controlled conditions using ingredients of the highest quality. MSC-Brew GMP Medium offers consistent lot-to-lot performance and optimal conditions for the cultivation of MSCs. MSC-Brew GMP Medium supports the attachment and expansion of MSCs from primary tissue without coating of cell culture vessels. 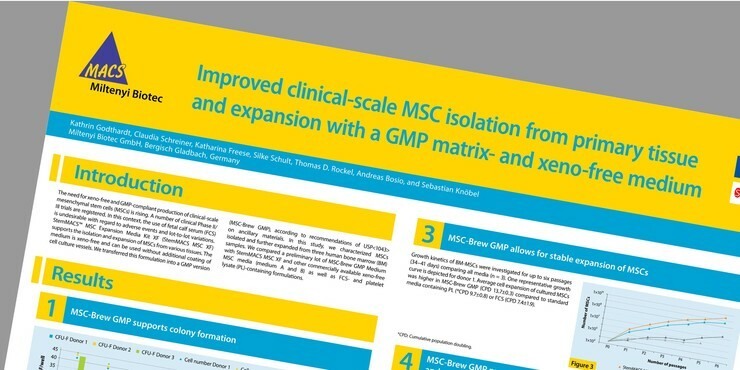 MSC-Brew GMP Medium supports efficient expansion of bona fide MSCs at a clinically relevant scale suited for cell therapy and preserves an immunomodulatory phenotype. MSCs retain their immunosuppressive potential when using GMP-compliant freezing conditions.